This uses the original formula from the first 5 games in the series (Where In The World, Where in Europe, Where In America's Past, Where In Time, Where in the USA) and extends it to our knowledge of astronomy and space. Carmen has shifted to space with her gang of alien outlaws, it's up to the player to climb to the cosmos and track them down. 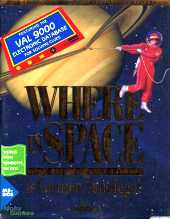 This games uses the familiar gameplay of the Carmen Sandiego series to test astronomical knowledge. "On board the Acme detective Agency's outer space surveillance craft, your main source of information is the VAL 9000 computer. Val provides information about the history, science, and mythology of space that will aid you in your search. Your search may be extensive. The game includes 32 locations and 1100 clues!" The program features superb digitised NASA images of the sun, planets and moons, star searches, talking aliens, planetary fly-bys and launches of interplanetary probes. The original music score includes different themes for each planetary system in digitised sound. A clear manual is included. Also Included in the package is an astronomy booklet to enhance your enjoyment of the night sky.